IBIX Abrasive Systems are built for NON-DESTRUCTIVE surface cleaning with LOW pressure precision and safety in mind. DO NOT Blast with an Abrasive Media harder than the structural integrity or the surface hardness of the surface you are cleaning. Garnet or Soda will work for most restoration related jobs. Each Abrasive material is classified for Hardness. Each Abrasive material is produced in a variety of Grit-Mesh-Grain sizes. Indicates the SIZE of the Abrasive Particle. Soda (SOFT) is a powder, so it is not going to be as aggressive as garnet and that is great for things you don’t want to scratch, “pit” or damage-like softer or smoother materials. Keep in mind- it will create a lot more dust, but it also has deodorization properties and is soluble in water, to be rinsed away. Once you understand the Hardness and Variety of Mesh/Grit for abrasive media, you can focus on the other variables. The abrasives listed are suggested or recommended for specific types of jobs, but adjustments to several variables directly affect cleaning capacity. How much abrasive is needed? What air pressure is needed? What environment are you working with? What substrate are you blasting? The IBIX soda blasting process offers you the best cleaning and decontaminating solution with no need to stop your production line. 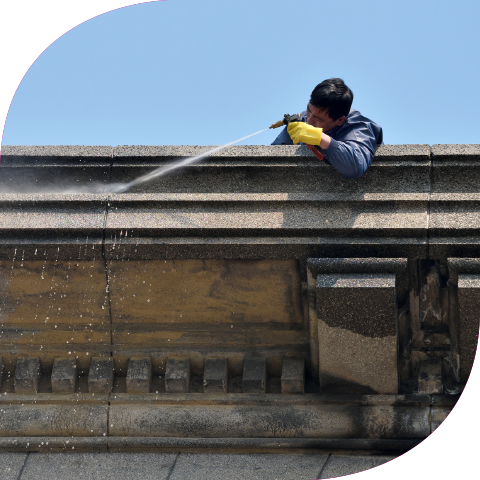 ARMEX® baking soda is totally soluble and the IBIX soda blasting process leaves no residue. Ground walnut shells are a type of abrasive blast media used for cleaning. Typical substrates are metals, fiberglass, woods, plastics and stone. The walnut shells are ground to various sizes from coarse to extra fine depending on the application. The walnut shells are used in the same manner as typical blast media. Walnut shells are durable and can be re-used in many applications. IBIX® Portable Preparation Systems & Fine GMA200 Mesh Garnet Abrasive are scientifically formulated to work together on delicate restoration projects. Cleaning valuable historic assets, masonry, concrete, grout, stone, marble, tile and much more, GMA Garnet is a cost-effective, high-performance, environmentally friendly abrasive.